Welcome to Snazzy Photo Booth. We are a mobile photo booth company devoted to making your event unforgettable! 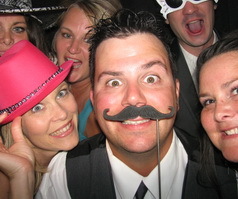 Photo booths help to create a fun, interactive, and memorable time for guests. Weddings, graduation parties, corporate events, school dances, group outings, and reunions are perfect occasions to unite your guests with the fun of our unique photo booth experience. We service all of lower Michigan – including Saginaw, Bay City, Flint, Midland, Mt. Pleasant, Frankenmuth, Lansing, Grand Rapids, Detroit.